Nine Americans die every day due to distracted driving, reports DMV.org. These deaths are completely preventable if drivers of all ages (it’s not just teenagers) would keep their eyes and complete attention on the road. It never hurts to brush up on the rules of the road and what constitutes as distracted driving according to state laws. Anyone can do so with the help of driver tools like Driving-Tests.org. Whether you haven’t driven in awhile, are teaching your teenager to drive or are allowing employees to drive company cars, you should go over driving rules and best practices, including how to stay focused in the drivers seat. This app targets several groups of people, including parents and business owners. Families can download the app to encourage each other to drive safely without smartphone distractions. The app blocks texts and calls while you’re driving, and alerts parents if their teen driver unlocks the app while they’re driving. It also can send parents a notification when their child reaches their destination safely â€” meaning you are never left wondering when your teen inevitably forgets to text you. Business owners can use this app for their fleet to monitor good driving behavior. The app sends a weekly report and analytics for you to see any violations. 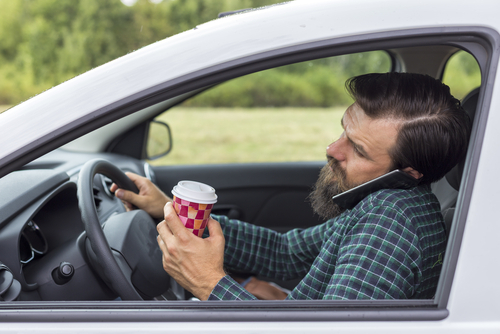 Sometimes you need your smartphone while you’re driving, but you still need to keep both hands on the wheel. This is where Drivemode comes in. The driving app silences phone calls and text messages while you’re driving, but still gives you access to necessities on your phone. With just your voice you can reply to text messages, make hands-free phone calls and even search your navigation app. You also can program a one-press button for your music apps. So you don’t have to go back to the olden days of plotting a course on a map and singing to yourself; you can use your phone safely and without distraction. You may be wondering if passengers can use their phones while in a moving car. With the Cellcontrol app, they can. You can set up customized policy zones that let the passenger and back seats still use their cellphones while eliminating distractions for the driver. When the car is moving, calls, texts, social media and games are blocked so you can’t be tempted to pick up your phone and take your attention away from the road. Similar to LifeSaver, this app has specific features for both families and businesses. Make safe driving fun with this gamified app. When you reach speeds higher than six miles per hour, the app starts awarding you points. If you press the Release button to use your phone while you’re driving, you lose all of your points. When you reach your destination the app will tell you how many points you earned. You then can use your points to get discounts on products in their marketplace. If you’re really competitive, you can play against your friends and other drivers on the road.